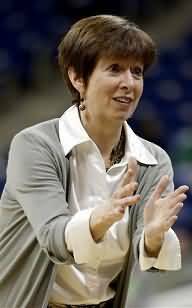 At Notre Dame, Head Women's Coach Muffet McGraw has led her Irish to the 2018 and 2001 NCAA National Championships. Over more than 30 years her teams have been to eight Final Fours (1997, 2001, 2011, 2012, 2013, 2014, 2015 and 2018), and have won 77% of their games. Below are several videos of her favorite shooting drills with assistant Beth Cunningham, using the Shoot-A-Way Gun. The Shoot-A-Way gun is a great tool, but if you don't have a Gun, you can still do these drills using assistants or managers to make the passes out. These shooting drills are helpful in their breakdown of the Princeton offense, getting shots that they expect to get within their offense.